Well done to Eco Comics! 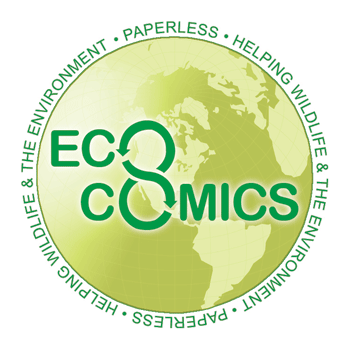 Eco Comics has today announced that it is a winner of a Green Apple Award. The award was presented to the comic book and graphic novel publisher during a carbon-neutral ceremony at the House of Commons, Palace of Westminster in London. The publisher said: “Global deforestation by paper production continues to have a major negative impact on the eco-system. Therefore Eco Comics takes advantage of the emerging digital technologies to produce exclusively in the new frontier of the paperless format. “The publishing industry, and readers, must realise that wildlife, such as tigers and gorillas, is likely to pay the ultimate price of deforestation: extinction. Even sustainable forestry is not a magic cure-all, shown by the criticism received from leading environmental organisations. In a continuing bid to raise awareness through various initiatives, the publisher recently brought the legendary Green Man to comic books, with the character also becoming its official mascot. Eco Comics competed against more than 500 other nominations at the awards ceremony. DriveThruComics: New Titles & 50% Off Sale on All McFarland eBooks!